Color the milk, mail, and moth. 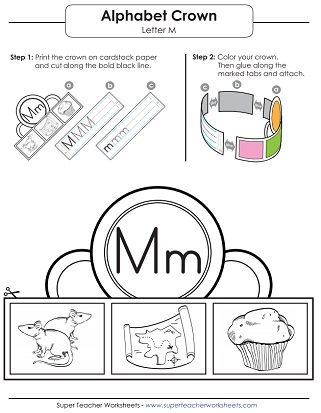 Then trace and write the letter M and m.
This headband has pictures of a map, mice, and a muffin to be colored in, as well as lines to write the letters M and m.
Practice writing lower-case m on this printable worksheet. 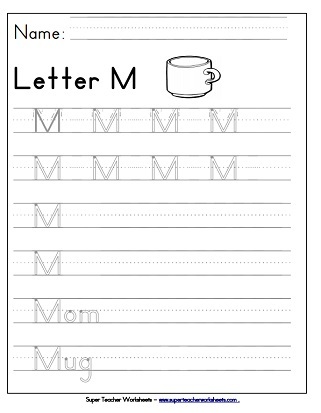 Trace along the gray lines to write lower-case m.
This worksheet instructs how to write capital letter M by tracing on the dotted lines. Another worksheet to help practice writing capital M.
Find the letter M m, the write M and m five times each, then write words that start with letter m.
Practice letter recognition with this worksheet. Dab the circles with colored ink daubers in the shape of letter M.